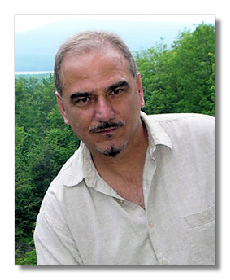 George Tsontakis (born October 24, 1951, Astoria, New York) is active both as composer and conductor. He has been conductor of the Aspen Music Festival Contemporary Ensemble where he has been a teacher of composition since 1976. His music is increasingly being performed and his commissions include quartets for the Emerson Quartet and the American String Quartet. He is currently writing a violin concerto for Cho-Liang Lin and a percussion concerto for Evelyn Glennie. He studied with Roger Sessions and Hugo Weisgall. "his music's powerful craft, its splendid pacing, its happy union of a wealth of musical languages … its profound spiritual impulse, even when it does not purport to examine 'spiritual' matters." And George Rochberg, one of America's senior composers, says, "He has the 'luck' of having concrete musical ideas that the ear can perceive and the mind can hold in memory."